Having an insanely slim laptop is awesome… until it comes time to actually connect something to it. Then it’s USB-C or bust, which means most of the time it’s bust. Think about it: how crazy is it that you can’t even connect an iPhone to a MacBook Pro laptop anymore without shelling out an extra $35 for a USB-C to Lightning cable? $35! And that’s just for your iPhone — what about USB-A slots? What about an HDMI port? What about an Ethernet port? 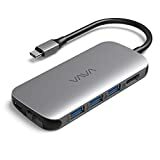 Kill all of those birds with a single stone by snagging the VAVA VA-UC006 USB C Hub Adapter while it’s on sale on Amazon. It retails for $59, but the coupon code TZV6YFJX drops the price to just $39.99. That’s a sweet deal when you consider the fact that it adds three USB 3.0 ports, an HDMI port, a gigabit Ethernet port, an SD card slot, a microSD card slot, and a USB-C port with power passthrough to any laptop with an open USB-C port.